It has been a long time since I last baked anything. I'm going to mail a care package to my skating coach in Europe so I decided to include some sweet treats to cheer him up. Blondies and brownies are both sturdy enough to withstand shipping so I gave another two recipes a try from the Martha Stewart's Cookies cookbook. The one on the left is Butterscotch-Cashew Blondies (p. 277) and the one on the right is Chocolate-Ginger Brownies (p. 276). Due to a lack of ingredients at home, I made some minor changes to the recipe. For the blondies, I replaced the toffee bits with equal amount of butterscotch chips. Alas, the toffee bits would have added such a nice crunch and a deeper layer of butterscotch flavour. This is the third blondies recipe I attempted from this cookbook and it is by far superior. The use of cashew is a nice change from the more popular walnuts or pecans. The buttery taste of the nuts made these blondies a rich treat. The texture is cakey and tender. I love combining chocolate with sweet spices. These chocolate-ginger brownies has a nice bite from the ground and freshly grated ginger. I skipped out on the grated nutmeg and added 100g of dark chocolate chips to the batter to add some bulk. Only afterward did it occur to me that some chopped crystalized ginger would be a great addition to this recipe. The recipe calls for 8 inch square baking pan but I doubt the batter yields enough. Even with the use of the chocolate chips and a 7 inch pan, the finished brownies are merely an inch tall. 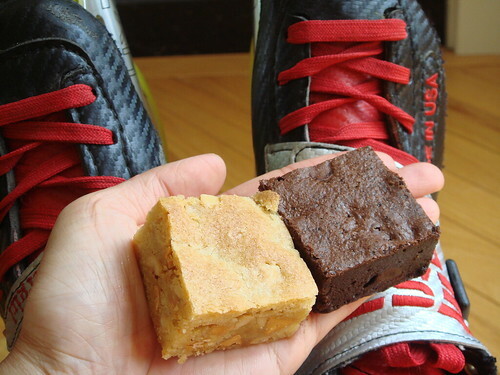 This is a dense, almost fudge-like, brownie. I would recommend cutting them in smaller servings. I really don't know what to do. I feel as if there's a huge weight on my chest, so heavy that I can't breath. I am very certain that I do not want to be romantically involved with him (and to be involved with him at all was a mistake). However, having him at the outskirt of my life remains a test of my toughness every day. I cannot yet wrap my head around the idea that there is something so nasty about my personality that made him drop me like a hot potato within the span of one weekend. I really hoped that was not true but when confronted, he only evaded and offered not even a hint of denying. How can I not be convinced I really do disgust him so much? I am scared that I am really such a horrible person and the only reason my friends have not abandoned me is because they have not yet find out about this other side of me. This has been a fear of mine for as long as I can remember. When he rejected me for, essentially, the core make up of who I am, my worst nightmare came true. I wake up every morning and pep talk myself into a more cheerful person. I try my best to look at the world around me in a more positive light but I am not sure anymore that I am not fighting a losing battle. I try hard to give as much of myself as I can to my friends and family. Yet the fear that they will find out what a phony I am is looming ever so near. It has already happened once with EG so who's to say if he's with the majority or not? I certainly don't have that unwavering belief in myself right now to say his decision was the exception. Growing up in Hong Kong in the 80s, a lot of my childhood food memories are associated with western-style cuisine as interpreted by Chinese. The sizzler plate is one particularly memorable item. Typically, it is a steak dinner served on a hot heavy cast-iron plate. The waiter would gingerly place it in front of me with a silver gravy boat at the ready. That is the cue for me to unfold my paper napkin and hold it like a curtain between my face and the food. As the gravy was poured over the steak, everything sizzle along with smoke and aroma which would linger on my clothes long after the meal ended. I love the theatrics and the multi-sensory experience of a sizzler dinner. Nine times out of ten, restaurants serve sizzler as a set dinner (aka prix-fixe) to make the whole western dining experience complete. There is always a choice of cream or borscht soup (borscht of course) and sometimes a side salad for appetizer. A sweet dinner roll accompanies the soup and it is best when sliced in half with a nice cold slice of butter slowly melting by the warmth of the bread. The fries and blanched mixed vegetables are the best accompaniment to the steak to mop up all the excess gravy. Of course, no meal is complete without coffee/tea and dessert. Dessert is usually a little cup of jello or mango pudding drizzled with evaporated milk. Now that I am all grown up, the sizzler dinner does seem a little cheesy but it still holds a special place in my heart. It is what I immediately think of when I crave a "steak dinner". Luckily, there are restaurants in Toronto that specialize in this type of Hong Kong-style western cuisine once you venture to Richmond Hill/Markham. My favourite haunt is only five minute drive from my home so I don't even need to make a special trip to satisfy my craving. In recent months, I've drastically decreased my consumption of red meat. One problem is that it is difficult for me to get enough iron from my meals. Since iron plays a very important role in my athletic performance, I've decided to start eating two meals a week with red meat. At $15.99, it is certainly a very affordable way to enjoy a steak dinner with all the trimming!